Enjoy breathtaking ocean views of Puerto Chico, Isla Palominos, Culebra and Vieques from our spacious 3 bedroom 2 bathroom condominium. Peña Mar Ocean Club is 45 minute drive along scenic highway 3/66 from the San Juan Airport (SJU). Along the way you will enjoy views Puerto Rico's lush, tropical landscape, the Caribbean sea and El Yunque National Forest. Hungry after your flight? Stop at the Kiosks in Luquillo for a bite to eat or stop at one of the many roadside stands selling fruit, coco frio, smoothies, and dinner (Frutera Flores just before the Kiosks in Luquillo)! Arriving in Fajardo you will see it is the perfect blend of tranquil beach living and modern convenience. EVONO grocery store, Walmart, CVS and Walgreens are among the many convenient and familiar stores. Book with us and you will enjoy 24hr gated security, elevators, modern conveniences including spacious open-concept floor plan, 3 beds (king, queen and 1 twin and 1 full size beds), 2 bathrooms (1 en suite), eat-in kitchen, dining area, air conditioning, washer/dryer, dishwasher, flat screen tvs, wifi, granite countertops, all kitchen essentials, cable tv, all linens, beach chairs and towels, pack n play, iron and ironing board, tennis equipment, snorkel gear and much more! Excellent dining is only a short drive away at restaurants including La Estacion, el Veradero, el Conquistador resort, Calizo, di Yukas, Metropol, la Ola, and Passion de Fogon. Looking for adventure? 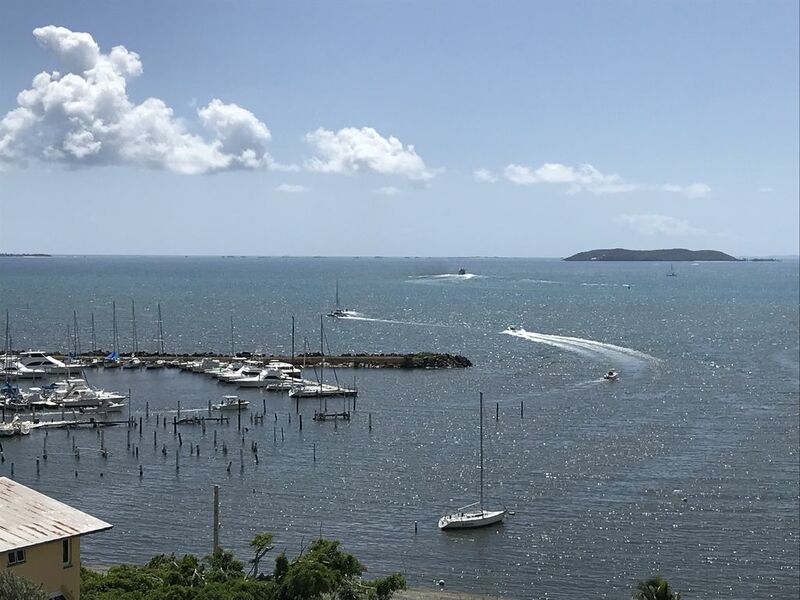 Fajardo and the nearby area offers excellent beaches, snorkeling, scuba, fishing, boating, sailing, zip lines, water sports, rainforest, bioluminescent bay and air travel to Culebra, Vieques, U.S. Virgin Islands and beyond! PeñaMar is also the ideal location for travelers who would rather just stay put and relax. The grounds are beautiful and well maintained, including 3 pools, tennis court, basketball court, childrens play area, outdoor lounge area and fitness center. So what are you waiting for? Come to beautiful Puerto Rico! My husband Dave and I both grew up and currently live in Northeastern Pennsylvania. We have two children who share our love of travel and especially the outdoors. We fell in love with Puerto Rico in 2013 while enjoying an escape from the brutal Pennsylvania winter. We traveled back several times and discovered the climate is wonderfully and consistently warm. The flights are convenient and fairly quick. The people are as warm and friendly as the weather. And there is so much to see and do that we decided to make it our home away from home. We hope you enjoy it as much as we do! The view from our balcony is what really drew me to this property. I make sure I am up, with coffee in hand, each morning to watch the sunrise. The view of Puerto Chico and beyond is ever changing. Boats come and go. Fisherman reeling in their catch. Seabirds gliding through the sky. It is truly mesmerizing! Unobstructed view of Palomonito Island and Puerto Chico. There are 2 separate dining areas. Each seat 4 people. There are 2 flat screen tvs. One in the living area and one in the master bedroom. Large balcony with seating for 6. Amazing unobstructed ocean view. There are three pools on the property. Guests provide their own toiletries. We have stayed at Sheryl’s place twice now. Really appreciate her keeping up the condition and all the thoughtful amenities for a great stay - loved the electric juicer for fresh lime margaritas! Sheryl is very attentive and responsive. So long til next year. I loved the breath taking ocean view. The complex had a beautiful infinity pool, that was short drive/walk from our complex. The condo was everything I expected. I would stay here again when we come back to Farjado. Note: it is in a gated community so there are lots of rules. If you are looking for relaxing peaceful vacation then this is your spot. The owners did a wonderful job of creating a book with all of the local shopping and eating. One of the restaurants, Pasion por el Fogon, she recommend was delicious. There is so much to do in Farjado... and this condo is in a perfect location. The condo was clean and beds were comfortable. They even provided chairs and a boogie board to take to the beach. Beautiful home. Beautiful place. Great location. The view is amazing. Family friendly. Great for a family! Plenty of space for 4 people. Very nice condo! Beautiful view! Well stocked with beach equipment ( chairs, towels, coolers, boogie boards). Everything was as advertised. Condo is very clean and well stocked. Numerous items for the beach and the pool. This is a major plus when traveling with children. Additional information will be sent regarding direction and house instructions prior to your arrival.